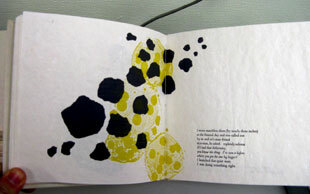 Annie Herlocker: "My initial discovery of woodcut printing eventually led to my interest in bookmaking. It was after I made a second print from a single woodcut that I realized printing multiples did not equate to printing duplicates. In other words, each print is different though it originates from a single source. It is the ritual of making editions of a piece of work that is central to my relationship with printmaking and letterpress printing. I find comfort in producing multiples and the variety of articulation that occurs with each print." Northport, Alabama: Paper Revival Press, 2010. Edition of 50. 6.75 x 8 x 1"; 60 pages. 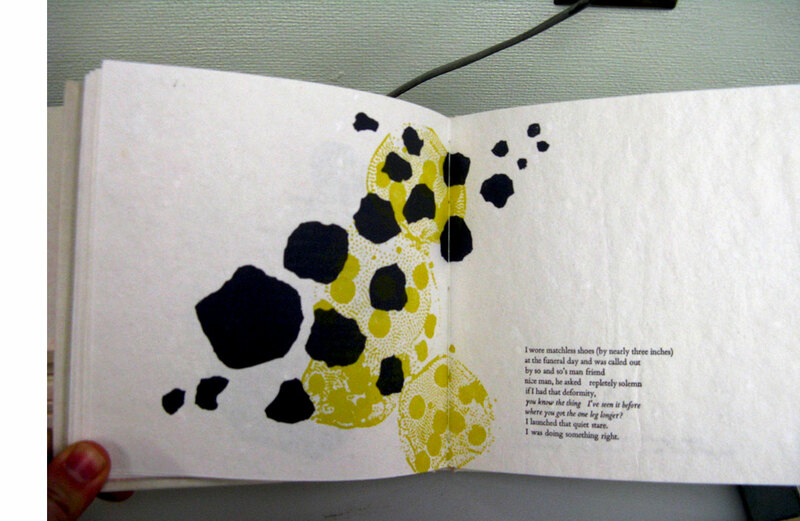 All paper used for this book was handmade by the printer using a blend of cotton and abaca fibers. An element of food is present by the use of walnut-dye used to create a brown hue for the cover papers and endsheets. Housed in Brown paper slipcase. Illustrations by Lucy Player. Annie Herlocker: "This cookbook explores the uniqueness and growing presence of small farms in Alabama. 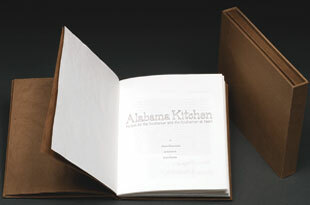 Three Alabama farms contributed a total of 24 homegrown recipes to this culinary text. 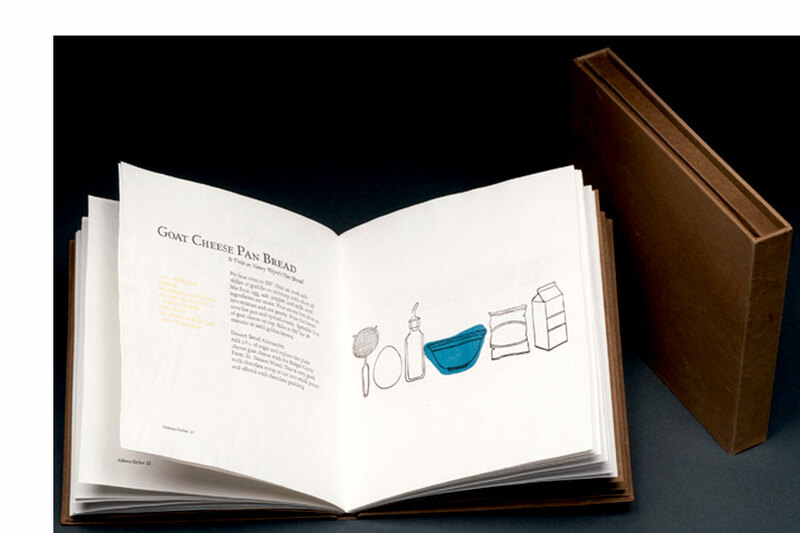 My goal when making this text was to produce a finely crafted book using precious materials that could also be used as a practical tool in the kitchen, without worry of dirtying the pages. It is precisely the visible use of this book that will bring this book into its ideal state. Several blank 'notes' pages are included in the back of this book for taking notes or recording personal family recipes." Northport, Alabama: Paper Revival Press, 2009. Edition of 100. 6.5 x 6.5"; 14 pages. Printed on French Paper (construction text weight) and French Paper (cover stock). All illustrations (by the author) and text were printed using photopolymer plates. Pamphlet-stitch bound. Paper wraps. Seven recipes from Alabama farmers. Annie Herlocker: "Tuscaloosa, Alabama, has a fantastic farmer's market every Thursday. The quality of food and the spirit of the local farmers inspired me to print this recipe book, which I intended to produce to replicate the idea of a true democratic multiple. I gave half of the edition to Tuscaloosa residents free of charge. 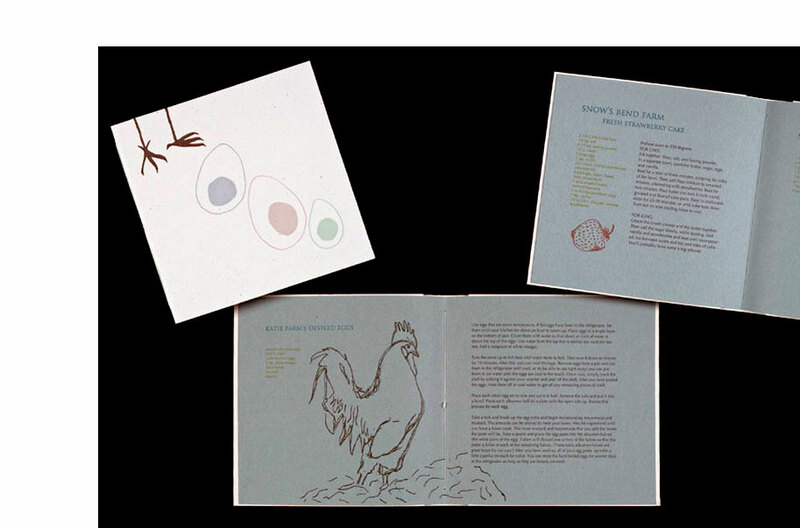 Snow's Bend Farms, Katie Farms, and Hewett's Honey Farm donated recipes for this publication. I also included a listing of more than 40 Alabama ood producers and their contact information." Northport, Alabama: Wooden Nickel Press, 2008. Edition of 32. 3.5 x 5"; 7 pages. Letterpress printed with handset type on a Vandercook SP-15 proofing press. A combination of woodcut and linoleum relief print illustrations. Printed on khadi (cover) and biblio (text) papers. 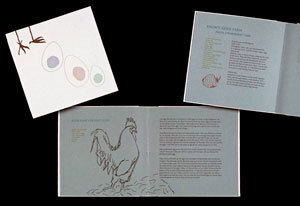 Pamphlet bound with four-panel pull out illustration. A Tiny Lesson in Bee Culture is an excerpt from L.L. Langstroth's Hive and The Honey-Bee: The Classic Beekeeper's Manual. I have repeatedly witnessed, in my observing-hives, the whole process of swarming. On the day fixed for their departure, the queen is very restless, and instead of depositing her eggs in the cells, roams over the combs, and communicates her agitation to the whole colony. ..
Penn State Live (website), June 10, 2010, "Entomology graduate fellowship to honor apiarist Lorenzo L. Langstroth": The Rev. Lorenzo L. Langstroth was a Philadelphia-born apiarist, clergyman and teacher who in 1851 revolutionized the beekeeping industry in the United States with the invention of a new beehive. His top-opened, movable-frame structure effectively used what he called 'bee space' and allowed the beekeeper to easily inspect and manage the hive in a way that previously had not been possible without disturbing the bees and their home. The Langstroth Hive continues to be the standard used by beekeepers all over the world. "He also published several books on practical hive management, beginning with Langstroth's Hive and The Honey-bee, The Classic Beekeeper's Manual in 1853, which is still in print." 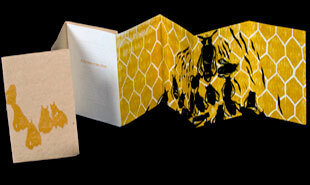 Annie Herlocker: "A long fascination in beekeeping led me to create this diminutive accordion." Northport, Alabama: Wooden Nickel Press, 2008. Edition of 40. 6.125 x 6.125"; 26 pages. Text is handset Bembo 10=point lead type letterpress printed onto handmade paper of abaca fiber and recycled cotton t-shirts. Endsheets are mould made Strathmore in white. Lace paper is Ogura, made from manila hemp. All images are relief printed using polymer plates and linoleum blocks. Handsewn binding with boards bound in light colored book cloth with the ghost of a printed image giving a hint of the internal motif. Signed by the artist in her maiden name: Annie E. Stalling. Annie Herlocker: "This book explores the fleeting and simultaneously irreparable feeling of grief due to the loss of someone close. As a teenager, I experienced the sudden and tragic loss of my father and my years spent understanding this grief sets the tone for the personal experiences set forth in this text. It was important to me that the materiality of this book greatly reflected the content of this book, and all the text paper is handmade from cotton and abaca – this physical component of laboring to make paper mirrors my own physical experience with grief. ... The color scheme is intentionally lighter and brighter in tone to exemplify the presence of grief within an otherwise healthy continuation of life. Grief does not always tinge every moment, but rather coexists among the living."